In the twentieth century, the doctrine of Scripture became a particular focus of intense criticism. Some of R. C. Sproul's most significant writings have been on the doctrine of Scripture. Not all this material is in print, and no volume has ever collected his best writings on this pivotal doctrine. Scripture Alone consists of four chapters that originally appeared in symposium volumes edited by others and the author's commentary on the Chicago Statement on Biblical Inerrancy. These writings constitute an important restatement of the evangelical doctrine of Scripture. Scripture Alone will help all Christians to stand firm in defense of the truth. 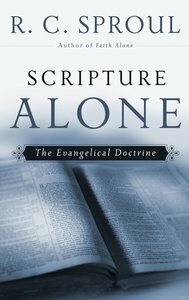 About "Scripture Alone: The Evangelical Doctrine"